Picture this: He’s an average looking guy with a boyish smile, one that seems to radiate when you see it. The doors are large and there is a knocker on the right hand side. He steps up, knocks, and then steps back. Seconds turn to a minute and toward a second one. He reaches for the knocker again, but pulls his hand away as a bolt releases, leaving a loud clang echoing in the night air. The door opens and our young hero is greeted by the faint light of a hallway that leads to a door thousands and thousands of feet away–or so it seems. Several steps in, the door is upon him and he looks back. The door he came into is gone, replaced by a gray wall. You would think fear would seize him, and maybe it does for a moment or two. But, this is our hero–the main character in every plot ever explored. Certainly, he can’t panic. Or can he? He opens the door before him and is nearly blinded by the brilliant white of the room. He shields his eyes, steps forward, maybe a little more tentatively than before. And he does know. He sits and the chair unfolds into a gurney, white sheet beneath him, pillow for his head. He lies back, lifts the sleeve of one arm. ”This will only hurt a little,” the voice says into his ear. He looks to see the man, a face flushed red, eyes white, no irises or pupils, lips a thin line across his face. And then there is the exquisite pain of a needle pricking the skin in the crook of the elbow, and the face is gone. Thus, the questions are asked of Mark Allan Gunnells, writer, storyteller… and blood donor. AJB: Who is Mark Allan Gunnells? MAG: Yikes, what a question. Haha… Okay, who am I? I feel like a character in The Breakfast Club, but I guess I can’t answer, “A jock, a princess, a brain, a criminal, and a basketcase” and get away with it, huh? AJB: Actually, I think it’s quite safe to pick a character from The Breakfast Club–or all of them if the case may be. AJB: Nice. I love the ‘story telling’ part of writing and my love of storytelling came from my grandfather, who was the best storyteller I’ve ever heard. Where did your love of storytelling come from? MAG: You know, that’s hard to say. I didn’t grow up in a household where books were really revered, didn’t have family that read on a regular basis. But one day I picked up a copy of Alice’s Adventures in Wonderland and fell into the story as surely as the character fell down the rabbit hole, and I was hooked on stories. And the more stories I read, the more I wanted to tell my own. Sometimes I attribute it to the fact that I grew up without any real friends, and therefore I made up a lot of games and played by myself, thus really developing my imagination. I know people who say when they were kids they played with dolls or toy cars, but they never pretended they were other people or in other worlds, and that seems so barren to me. My childhood was one of boundless imagination, and I guess I didn’t want to give that up when I got older. So I turned it into storytelling. AJB: Whoa, I just had a moment. When I was a child I did something similar, often pretending to be different people and creating events in my head as I lay in bed trying to fall asleep. So, is it a fair assumption to say you think of yourself more as a storyteller than a writer? MAG: Well, I guess I’d say I feel like a storyteller who tells his stories through the written word. I mean, I believe that the term “storyteller” encompasses more than just “writer.” Artists can be storytellers, singers and songwriters, actors and directors–all of these people can be storytellers. For me, the drive to tell stories manifests itself through short stories and novellas. AJB: Bob Dillon told great stories through his songs. Being a storyteller at heart, why did you choose to tell horror stories? MAG: I have been drawn to horror since I was a kid. I sought out scary movies and dark fiction. I found something thrilling about it, like a roller coaster ride, but also the limitlessness of horror appealed to me, the sense that anything could happen, absolutely no boundaries. It seemed like it would give my imagination free reign. Horror isn’t all that I write, but it is primarily what I write. My first and truest love and I won’t ever turn my back on it. AJB: Your drive to tell tales in the forms of short stories and novellas is much like the way I prefer to write. I find it refreshing that not everyone is gung ho about getting a novel out there. So, with that in mind, are there any novels in the foreseeable future? AJ: It does make sense. I’ve been told I should write a novel, but I have a love affair going with short stories and really don’t have much of a desire to write a full on novel. If I do write one, it will simply be because the story chose to be that length. I hear you have a short story collection out now. Can you tell us a little about it? MAG: Well, I actually have two. One is in print, Tales From the Midnight Shift. It is a limited hardcover from Sideshow Press with a gorgeous Tom Moran cover that is probably my favorite of anything that has graced my work. It contains 15 tales that I think show a range of subjects and styles. I also just released a digital collection through Bad Moon Books entitled Ghosts In the Attic. Fourteen tales here, no repeats from the previous collection. They are not all ghosts stories but they all contain a “haunted” quality in one way or the other I feel. Another beautiful Tom Moran cover here as well. AJB: Let’s talk about Tales From the Midnight Shift first. When did this come out and how did this collection come about? MAG: It was released in March of this year. I had been trying to get some publishers interested in a collection with no luck. My first deal with Sideshow was for a chapbook in a series they were putting out with myself, Brian Knight, Ed Lee, and Kurt Newton. Everyone else was providing novellas, but I, instead, provided three short stories (four if you got the limited hardcover set). My chapbook, A Laymon Kind Of Night, was actually fairly well received, and Tom decided to take a chance and offer me the chance to put out my very first collection. 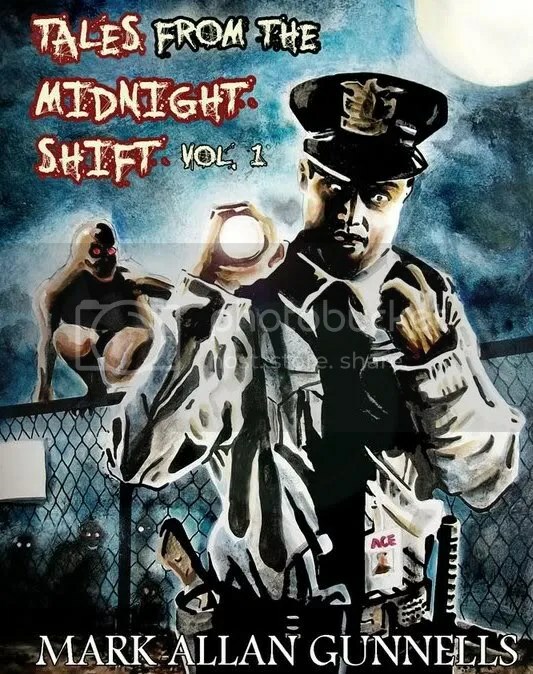 I had dreamed of this since I was young, and for years I wanted to put out a collection called Tales From the Midnight Shift due to the fact that for several years I worked 3rd shift and did most of my writing at work in the wee hours of the night. I have been very happy with all the books I’ve put out, but holding Tales in my hands was the greatest joy I’ve had as a writer so far. AJB: Aptly named title for the collection. What about this chapbook you spoke of? A Laymon Kind of Night? MAG: Yes, it is long out of print (although I am considering re-releasing it digitally if I can figure out how), but it contained three of my stories. The title story is homage to the late great Richard Laymon, trying to capture of bit of the roller coaster fun of his work; The Snoop which is a flash piece that also had a Laymonesque vibe; and Van People, which is my stab at the Stepford Wives. The hardcover contained the story Out of Print which can also be found in Tales From the Midnight Shift. A Laymon Kind Of Nightwas my first published book, and therefore I have a great deal of affection for that one. AJB: Yeah, I kind of guessed Richard Laymon figured prominently in the book. Very interesting. Now, how about this second collection of yours? MAG: Ghosts In the Attic is a collection I put together for Bad Moon Books. I was familiar with them as a customer and had some online interaction with Roy Robbins and Liz Scott. I decided to take a chance and inquired as to whether they’d be open to considering a collection. To my delight, I was told to put something together and send it their way. I went through my stories, and since Tales was largely previously unpublished stories, I decided with this one I’d do mostly stories that I had published before. They had mostly appeared in small magazines and e-zines (although two originally saw print in Dark Recesses), so I figured they were still mostly unknown. I sent the manuscript in, Roy seemed to really enjoy it, and so he agreed to publish it. We were originally talking trade paperback, but they have such a long list of works in the queue to be published it would be possibly two years before Ghosts would see print. 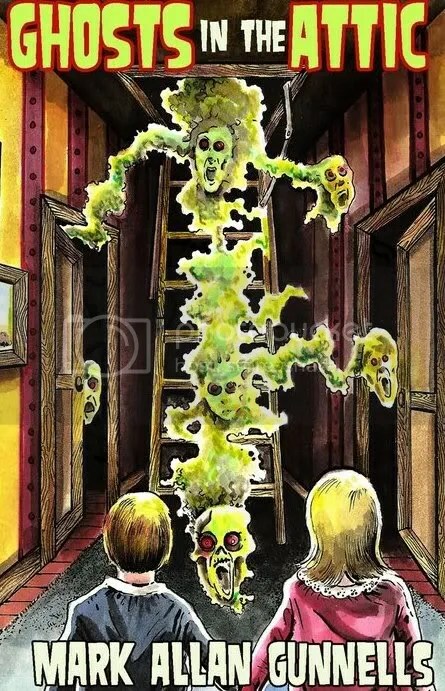 Knowing that Bad Moon was getting into the e-book game by putting out reprints of previously published material, I suggested Ghosts In the Attic become their first original digital book, and they agreed. AJB: Since you bring up Ghosts being Bad Moon Books’ first digital book, what do you think of the current trend toward e-publishing? MAG: I say anything that encourages reading is a good thing in my book. My novella Asylum did relatively well in its digital form, and I think it got some people to take a chance on it who might not have shelled out the money for a paper copy. Personally I will always prefer an actual book, but I am not one of those that thinks digital heralds the death of traditional books. I think the two can and will co-exist together quite nicely. AJB: Obviously having two collections out at one time is a good thing. Fans who like your work can get a double dose of Mark Allan Gunnells. With that in mind, do you think having a couple of books out at one time has helped you garner a little more of a fan base? MAG: Honestly, I was a little afraid having two collections out so close together would hinder me. Sort of spread me too thin, create a glut of me in the market. However, what I like is that Tales is a hardcover, and some people may not be willing to spend the bucks on someone so unestablished. But with Ghosts, it’s a very affordable digital, so maybe people will be willing to take a chance on me that way. And if they enjoy it enough, then they may take the chance on Tales. AJB: Being unestablished and putting out two collections may be a risk, but as you said, if someone buys Ghosts and likes it then they may pay the extra coins for <I?Tales. Is there a distinct difference in the two collections, other than one being mostly previously published works and the other being predominantly unpublished? MAG: Actually, yes. Tales, while it doesn’t consist of only this, does contain some of my more twisted tales, whereas the stories in Ghosts tend to be a bit… gentler. Not “lighter”, because plenty of dark and unspeakable things happen in these stories, but the tales aren’t as hard-edged. AJB: Do you find it harder to scare folks than, say, make them cry? MAG: Make them cry. It’s not easy wringing genuine emotion at all, but I find it easier to unsettle and disturb than to create a sense of sadness or joy to the point of tears. AJB: When you write a story what are you looking to do for your reader? MAG: Entertain. Maybe not the loftiest of goals, but when I write, my primary goal is to entertain. AJB: That may not be lofty in thought, but in deed, it is one of the highest goals you can set for yourself. In your opinion, what’s the key to a good story? MAG: Joy. I feel a writer that is joyous about his craft infuses his work with that joy. As a reader I can usually tell when a piece was written just to get a paycheck or to fulfill an obligation. When a writer takes true pleasure from the act of storytelling, it infects the reader. Of course a writer needs to master characterization and have some technical skill, but I truly believe that if he or she isn’t enjoying what they are doing than the result will be a flat story with no life in it. AJB: Does what you want out of a story when you read go hand in hand with what you want out of a story when you write?. MAG: Pretty much yes. There are some genres I enjoy reading that don’t interest me as a writer, but the basics I look for as a reader–entertaining story, well drawn characters, authentic dialogue–are all elements I want to bring to my writing as well. AJB: Have you received fan mail or a review letting you know you have done your job as a writer, that you accomplished what you set out to do with one of your works? MAG: Can’t say I’ve ever gotten any fan mail, but my novella Asylum actually got some very positive reviews that made my day. And the thing that really gets me is when I hear from other writers whose work I admire, and they have nice things to say. That is quite a thrill. AJB: Mark, is there a website or blog where readers can find out what’s going on in your world? AJB: Okay, Mark, before we pull the needle out and share the blood with various vampires in the area, is there anything else you want to tell the readers out there? MAG: Just that I’m a writer who craves feedback, good or bad. If you read my stuff, I’d love to hear your thoughts. AJB: Thanks for your time, It was a pleasure chatting with you. MAG: I can’t tell you how much I appreciate you doing this. And then it’s over. Mark awakes in his bed, confusion tripping along his brain. Did I..? What the..? Was it all a dream? (Herbie’s Note 2: This interview was done a little differently than usual, on purpose. If you like the way it was done, please leave us a comment. We’re looking for better ways to entertain our readers, both in our storytelling and in the way we conduct and relay our interviews. Thank you for reading. Phew!! Thanks for this. Nicely done. Glad to see Herbie is still around (STAPH administrator!) LOL! Great interview, guys. Mark is one of my favorite fags. Gee thanks Lee, you’re one of my favorite straighties.